The Used and eBook copies of this book are not guaranteed to include any supplemental materials. Typically, only the book itself is included. This is true even if the title states it includes any access cards, study guides, lab manuals, CDs, etc. Easy, clear, readable, and focused on what you want to do. Step-by-step instructions for the tasks you care about most. Large, full-color, close-up photos with callouts to iPhone photos that show you exactly what to do. Common-sense help when you run into iPhone problems or limitations. Tips and notes to help you get the most from your iPhone. Brad Miser has written extensively about technology, with his favorite topics being the amazing “i” devices, especially the iPhone, that make it possible to take our lives with us while we are on the move. 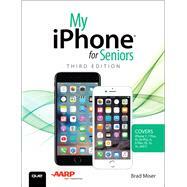 In addition to My iPhone, Tenth Edition, Brad has written many other books, including My iPhone for Seniors, Third Edition; and My Pages, Keynote, and Numbers. He has also been an author, development editor, or technical editor for more than 50 other titles. Brad is or has been a sales support specialist, the director of product and customer services, and the manager of education and support services for several software development companies. Previously, he was the lead proposal specialist for an aircraft engine manufacturer, a development editor for a computer book publisher, and a civilian aviation test officer/engineer for the U.S. Army. Brad holds a bachelor of science degree in mechanical engineering from California Polytechnic State University at San Luis Obispo and has received advanced education in maintainability engineering, business, and other topics. Brad would love to hear about your experiences with this book (the good, the bad, and the ugly). You can write to him at bradmiser@icloud.com.